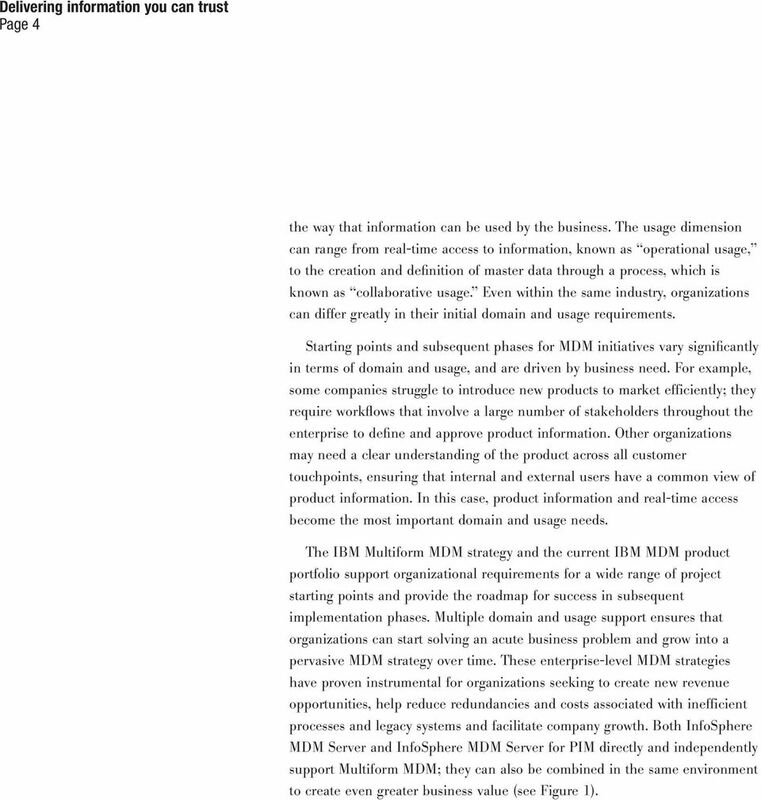 Download "IBM Master Data Management strategy"
4 Page 4 the way that information can be used by the business. The usage dimension can range from real-time access to information, known as operational usage, to the creation and definition of master data through a process, which is known as collaborative usage. Even within the same industry, organizations can differ greatly in their initial domain and usage requirements. Starting points and subsequent phases for MDM initiatives vary significantly in terms of domain and usage, and are driven by business need. For example, some companies struggle to introduce new products to market efficiently; they require workflows that involve a large number of stakeholders throughout the enterprise to define and approve product information. Other organizations may need a clear understanding of the product across all customer touchpoints, ensuring that internal and external users have a common view of product information. In this case, product information and real-time access become the most important domain and usage needs. The IBM Multiform MDM strategy and the current IBM MDM product portfolio support organizational requirements for a wide range of project starting points and provide the roadmap for success in subsequent implementation phases. Multiple domain and usage support ensures that organizations can start solving an acute business problem and grow into a pervasive MDM strategy over time. These enterprise-level MDM strategies have proven instrumental for organizations seeking to create new revenue opportunities, help reduce redundancies and costs associated with inefficient processes and legacy systems and facilitate company growth. 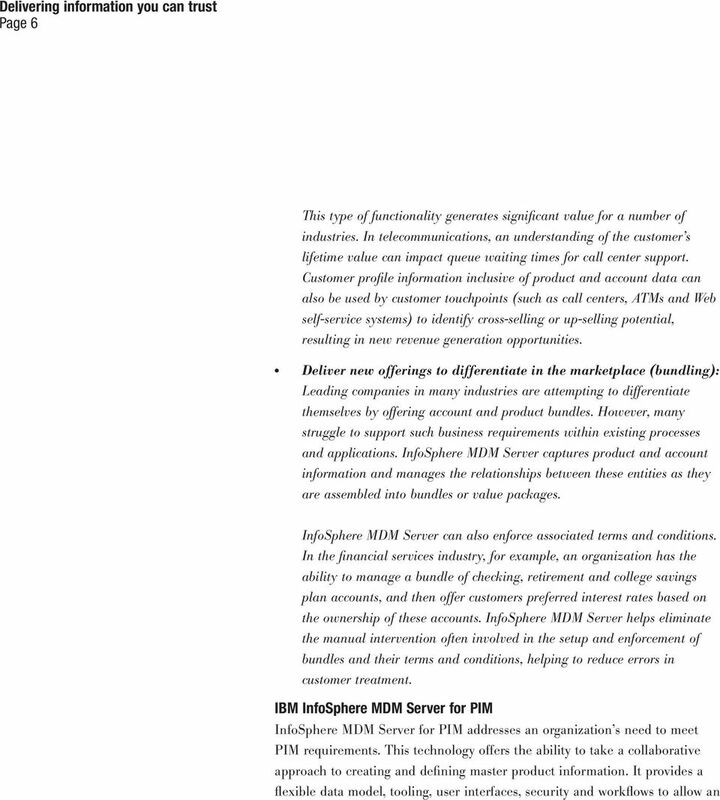 Both InfoSphere MDM Server and InfoSphere MDM Server for PIM directly and independently support Multiform MDM; they can also be combined in the same environment to create even greater business value (see Figure 1). 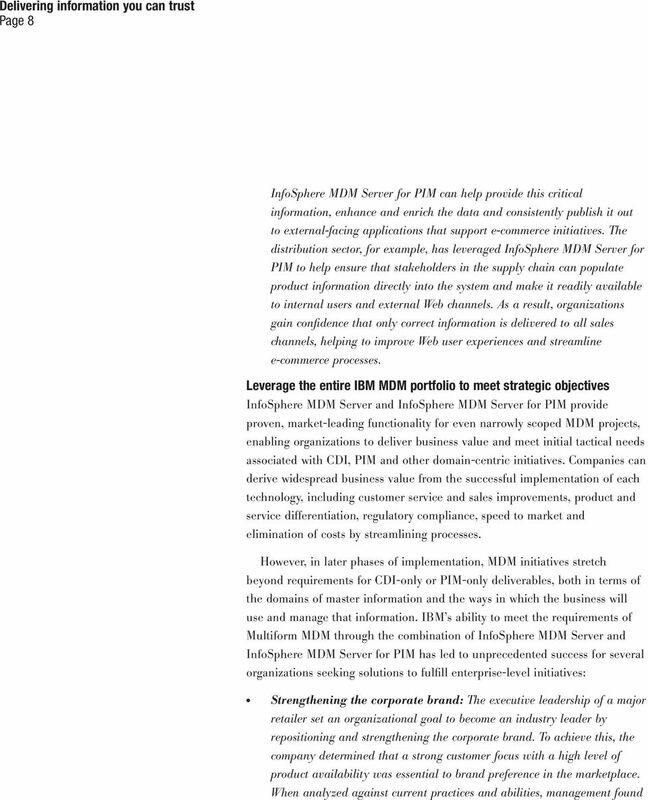 5 Page 5 Figure 1: IBM Multiform MDM can help you establish a single view of critical types of master data for use throughout an organization. 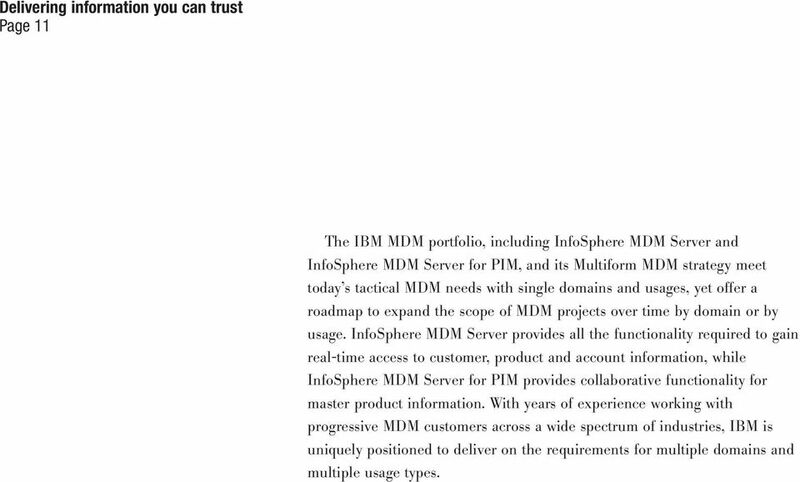 IBM InfoSphere MDM Server Designed to provide flexibility in its deployments, InfoSphere MDM Server cuts through the barriers imposed by separate lines of business (LOBs), applications and product-centric silos, helping to deliver on the promise of multidomain operational MDM. InfoSphere MDM Server is particularly effective in helping organizations gain real-time access to the trusted customer information needed for CDI projects, while also supporting real-time system access to master product and account data for other initiatives. 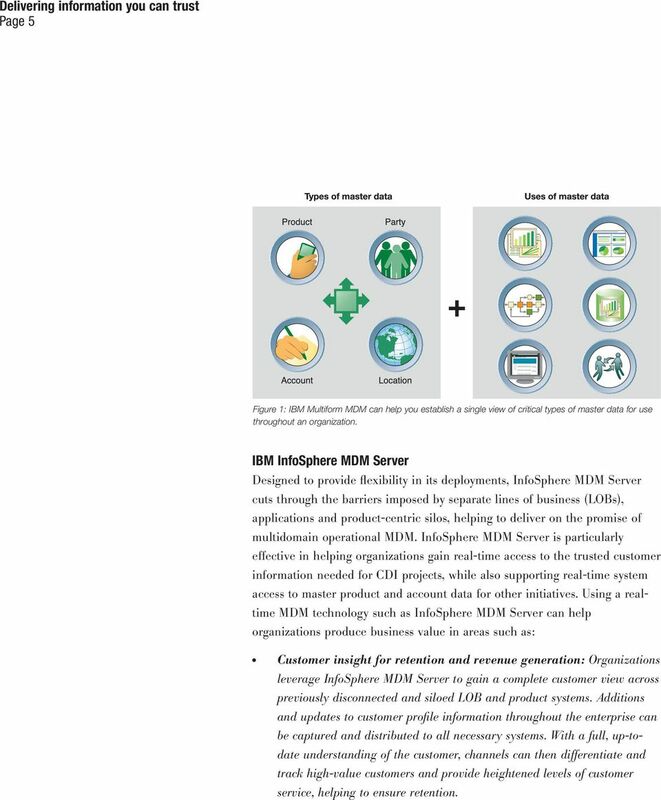 Using a realtime MDM technology such as InfoSphere MDM Server can help organizations produce business value in areas such as: Customer insight for retention and revenue generation: Organizations leverage InfoSphere MDM Server to gain a complete customer view across previously disconnected and siloed LOB and product systems. Additions and updates to customer profile information throughout the enterprise can be captured and distributed to all necessary systems. With a full, up-todate understanding of the customer, channels can then differentiate and track high-value customers and provide heightened levels of customer service, helping to ensure retention. 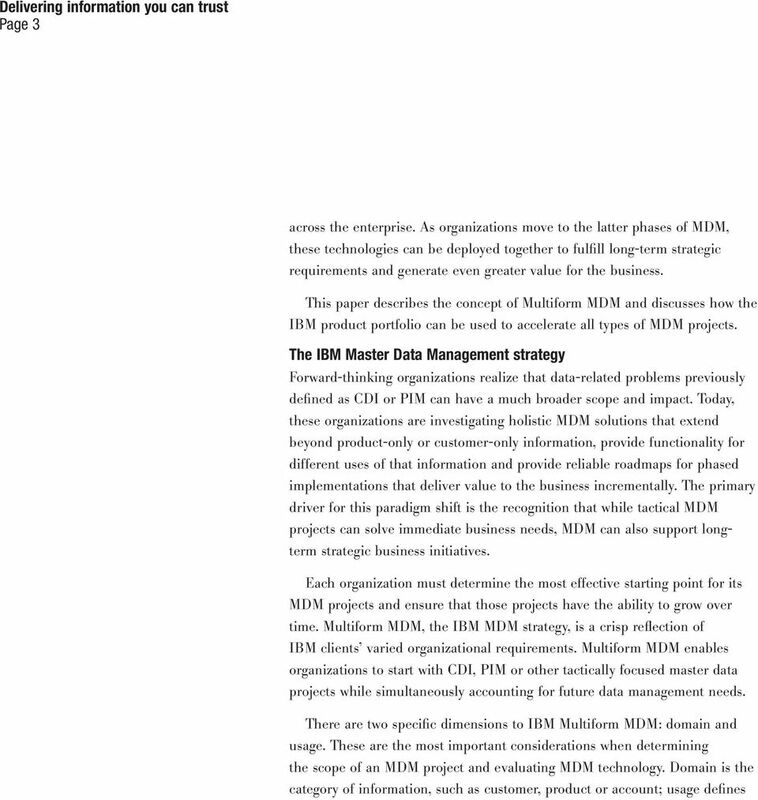 7 Page 7 organization to create and define product information without the traditional barriers imposed by business function or existing processes. 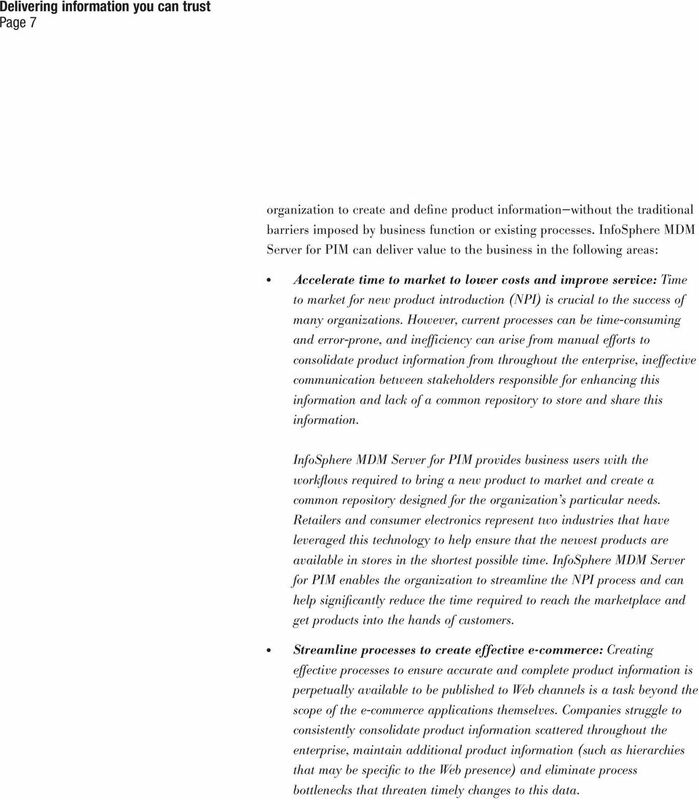 InfoSphere MDM Server for PIM can deliver value to the business in the following areas: Accelerate time to market to lower costs and improve service: Time to market for new product introduction (NPI) is crucial to the success of many organizations. However, current processes can be time-consuming and error-prone, and inefficiency can arise from manual efforts to consolidate product information from throughout the enterprise, ineffective communication between stakeholders responsible for enhancing this information and lack of a common repository to store and share this information. InfoSphere MDM Server for PIM provides business users with the workflows required to bring a new product to market and create a common repository designed for the organization s particular needs. Retailers and consumer electronics represent two industries that have leveraged this technology to help ensure that the newest products are available in stores in the shortest possible time. InfoSphere MDM Server for PIM enables the organization to streamline the NPI process and can help significantly reduce the time required to reach the marketplace and get products into the hands of customers. Streamline processes to create effective e-commerce: Creating effective processes to ensure accurate and complete product information is perpetually available to be published to Web channels is a task beyond the scope of the e-commerce applications themselves. Companies struggle to consistently consolidate product information scattered throughout the enterprise, maintain additional product information (such as hierarchies that may be specific to the Web presence) and eliminate process bottlenecks that threaten timely changes to this data. 9 Page 9 that meeting their goal would require new infrastructure to support greater levels of customer service and attentiveness to membership subscribers, while also delivering the newest products to market more quickly than competitors and minimizing product stock outage time. The business stakeholders, along with their IT counterparts, evaluated a number of solutions, measuring each one s ability to meet these aggressive objectives. The team also recognized that large-scale success would require a series of interrelated IT projects, each delivering incremental value to the business over time. From a customer service perspective, the organization needed to quickly recognize the customer, their preferences and membership level within stores at the point of sale, on a self-service Web channel and during call center interactions. Yet finding a solution for the customer information challenges met only half of the long-term requirements, as the company also needed an effective method of managing master product information and quickly bringing new products to market. The retailer selected the IBM Multiform MDM portfolio, including both InfoSphere MDM Server and InfoSphere MDM Server for PIM, as the strategic solution to gain this customer focus and manage product processes to strengthen the corporate brand. 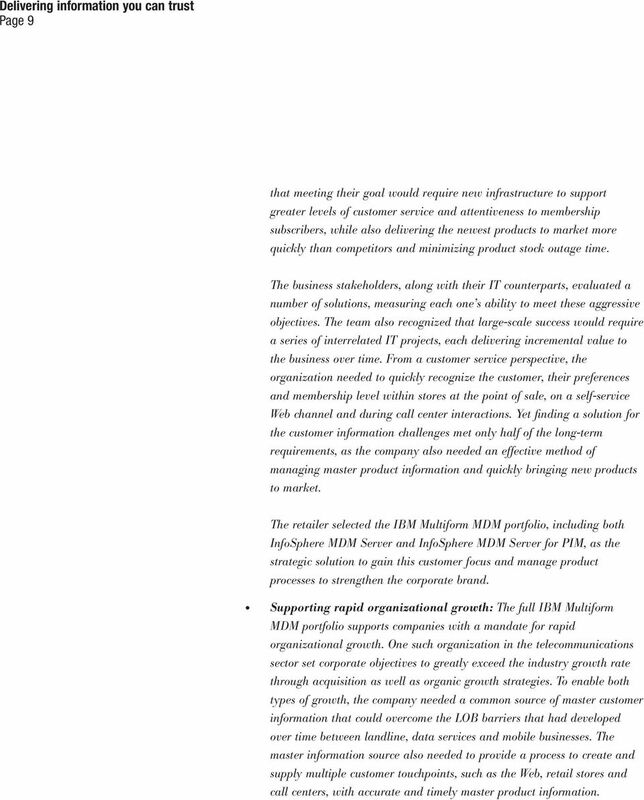 Supporting rapid organizational growth: The full IBM Multiform MDM portfolio supports companies with a mandate for rapid organizational growth. One such organization in the telecommunications sector set corporate objectives to greatly exceed the industry growth rate through acquisition as well as organic growth strategies. To enable both types of growth, the company needed a common source of master customer information that could overcome the LOB barriers that had developed over time between landline, data services and mobile businesses. The master information source also needed to provide a process to create and supply multiple customer touchpoints, such as the Web, retail stores and call centers, with accurate and timely master product information. 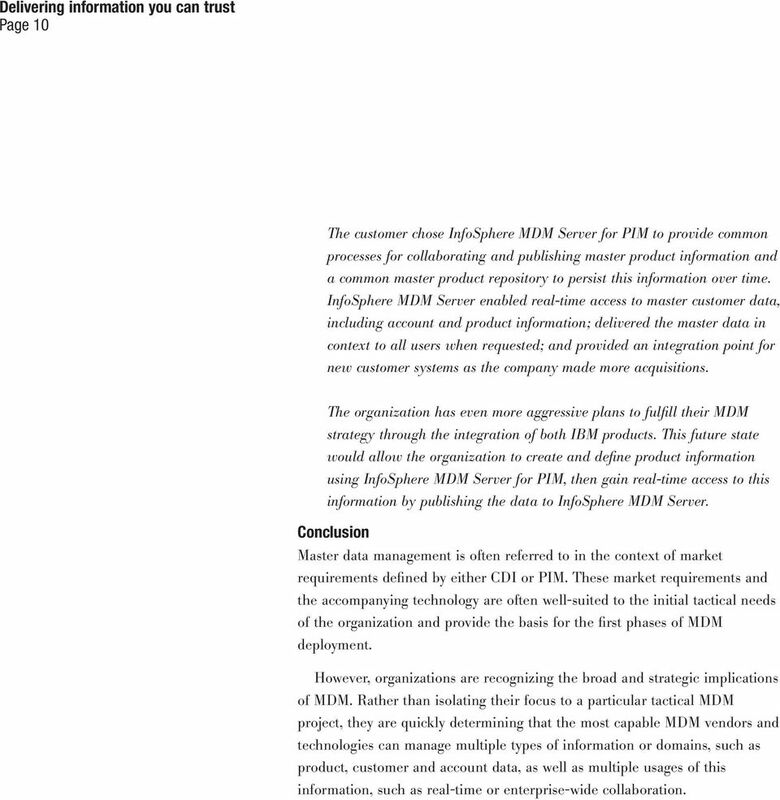 10 Page 10 The customer chose InfoSphere MDM Server for PIM to provide common processes for collaborating and publishing master product information and a common master product repository to persist this information over time. InfoSphere MDM Server enabled real-time access to master customer data, including account and product information; delivered the master data in context to all users when requested; and provided an integration point for new customer systems as the company made more acquisitions. The organization has even more aggressive plans to fulfill their MDM strategy through the integration of both IBM products. This future state would allow the organization to create and define product information using InfoSphere MDM Server for PIM, then gain real-time access to this information by publishing the data to InfoSphere MDM Server. Conclusion Master data management is often referred to in the context of market requirements defined by either CDI or PIM. These market requirements and the accompanying technology are often well-suited to the initial tactical needs of the organization and provide the basis for the first phases of MDM deployment. However, organizations are recognizing the broad and strategic implications of MDM. Rather than isolating their focus to a particular tactical MDM project, they are quickly determining that the most capable MDM vendors and technologies can manage multiple types of information or domains, such as product, customer and account data, as well as multiple usages of this information, such as real-time or enterprise-wide collaboration. 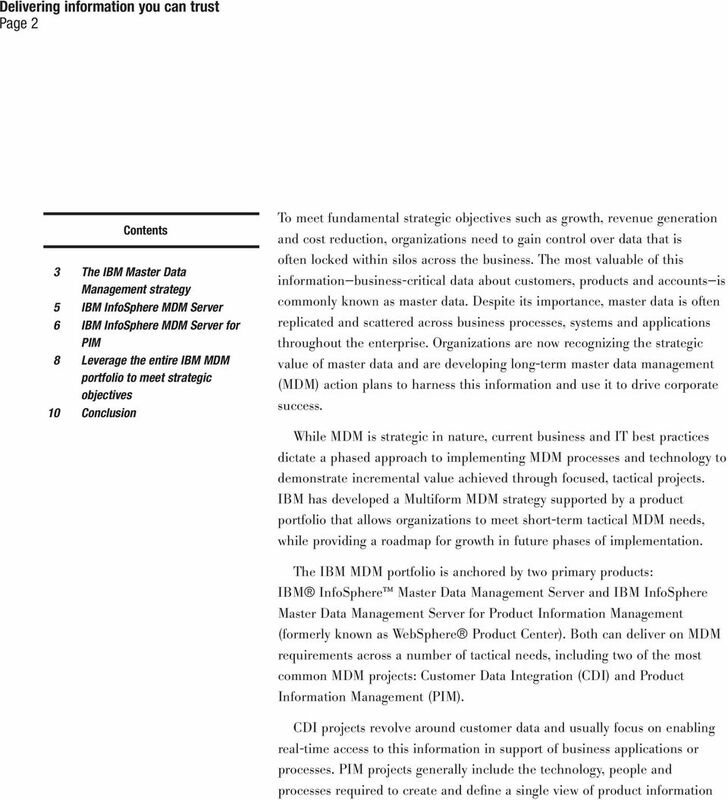 11 Page 11 The IBM MDM portfolio, including InfoSphere MDM Server and InfoSphere MDM Server for PIM, and its Multiform MDM strategy meet today s tactical MDM needs with single domains and usages, yet offer a roadmap to expand the scope of MDM projects over time by domain or by usage. InfoSphere MDM Server provides all the functionality required to gain real-time access to customer, product and account information, while InfoSphere MDM Server for PIM provides collaborative functionality for master product information. With years of experience working with progressive MDM customers across a wide spectrum of industries, IBM is uniquely positioned to deliver on the requirements for multiple domains and multiple usage types. Connectivity and integration Executive brief. Optimize the potential of ERP systems through IBM SMART SOA integration strategies. Master Data Management What is it? Why do I Care? What are the Solutions? Life insurance policy administration: Operate efficiently and capitalize on emerging opportunities. Enterprise content management solutions Better decisions, faster. Storing, finding and managing content in the digital enterprise. Modernizing enterprise application development with integrated change, build and release management. Change and release management in cross-platform application modernization White paper December 2007 Modernizing enterprise application development with integrated change, build and release management. Deliver enhanced sales and service opportunities by providing a foundation of unified customer data to all channels. Realizing business flexibility through integrated SOA policy management. Improving contact center productivity and customer satisfaction with a proven portal solution. Agile enterprise content management and the IBM Information Agenda. 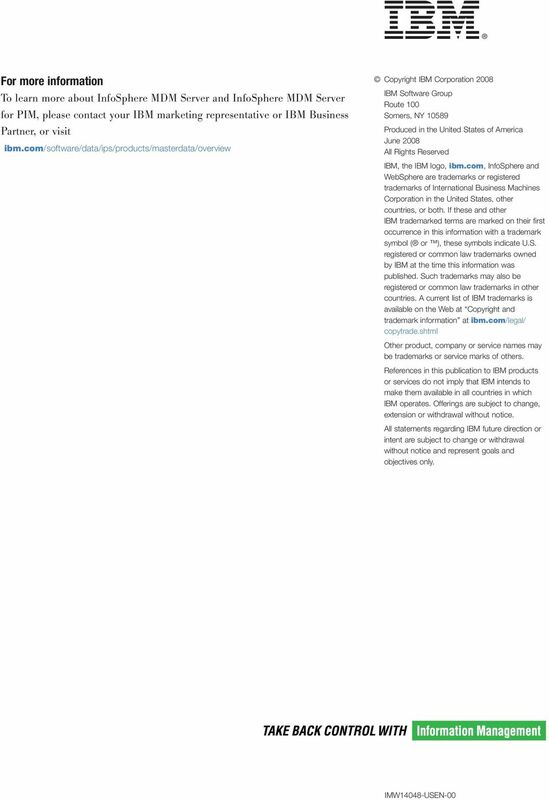 IBM Global Business Services White Paper. Insurance billing and payment transformation Why now? Performance Bicycle. Attracting high-value traffic and boosting conversion by up to 20 percent with an online Learning Center. Next-generation e-commerce for retail: How to optimize cross-channel marketing, sales and service. IBM Perspective on Cloud Computing. The next big thing or another fad? Introduction to SOA governance and service lifecycle management. Improving customer satisfaction and operational efficiencies with a proven portal solution.